The Youth Bike Summit strengthens the national movement of youth on bikes by developing leaders in a weekend of fun, advocacy, training, and workshops. 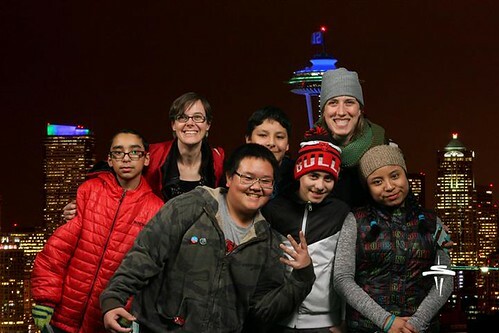 For the first time ever, the Summit took place in Seattle (previously held in New York City), allowing more opportunities for kids on the West Coast to engage in activities at the Summit. The youth from our programs who attended Youth Bike Summit were able to take the next step in their journey as bike leaders by experiencing a new city and a national conference, while learning about opportunities that await them tomorrow and beyond. They stepped outside of their comfort zones and were able to learn so much more than they would have in the classroom. We checked in with a few kids about their Youth Bike Summit experiences. What were some of your favorite activities at the Youth Bike Summit? Rosa: The first [activity] was designing the road. That was interesting because I didn’t know that people actually did that so it was great doing that. The people that were at my table we were all contributing when we set goals and values. That class was mostly about how to make the road better for bikers. That was very great. I did not know they designed roads for bikes and stuff, that was cool. I liked how I learned ways to prevent accidents. We designed bike ways to be safer for people to bike. If you were to describe the Youth Bike Summit to someone, what would you tell them about it? Miguel: I have learned about how to be a better leader in the future. What I learned is to believe or follow your dream. To get to your dream, you’ll have to go step by step. Encourage yourself and you will go even farther than you think you will go. How will the things you learned have an impact on your community? Rosa: The things that I learned would have an impact on my community because there are some girls in my community that are into bad stuff and really aren’t biking that much. So yeah, that would make an impact on my community. It is important for kids to have opportunities because we get to learn more, we get to see more, and we can have more. It gives us options or maybe things that we want to do when we grow up, or to inspire us to do new things. It is good to have opportunities as kids and maybe it will inspire other kids. What did you like about the city of Seattle? Alex: What I liked about the city of Seattle is all the different cultures there. It was so many. Everywhere you turn there’s a different person from a different culture so it was all mixed up and everything. Alex: The Space Needle is a very very tall building and very cold and windy, so don’t go there at night. It is a very high price entry ticket. And remember not to throw your ticket up in the air and lose it.